It felt like fall outside and I wanted roast chicken. I picked out a big organic chicken in Wegmans and asked the butcher to cut it up – a first for me, but I just didn’t want to struggle with it at home. A small luxury, and much appreciated! At home I already had those little buttery yellow potatoes I like so much lately, and a big crown of organic local broccoli. 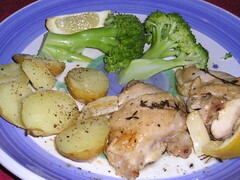 I slathered the chicken with olive oil and lemon juice, and tucked quartered whole lemon in the roasting pan, along with the whole potatoes and some large cloves of locally grown garlic from the Whole Earth Center. And some fresh thyme. What a fantastic dinner, and really almost no trouble at all. I’m still enjoying the leftovers, too. Ha! That looks like MY dinner I made over the weekend! Sure beats those pre-roasted chickens one gets at the store and so easy to do oneself!